I have received a ton of e-mails asking if I can recommend skin care products that are reasonably priced but still do the trick. I decided the best way to address this question was in a post. In my own business I use and sell a professional only line but I am all for sharing inexpensive products that work...all while saving you a few dollars along the way. All of the products I have listed are under $10. 1. Neutrogena Naturals Purifying Pore Scrub- a wonderful exfoliator that is free of any harmful additives and it is safe to use everyday. 2. Neutrogena Naturals Fresh Cleansing + Makeup Remover- a gentle cleanser that cleans the skin and removes makeup without stripping your skin of it's natural oils. 3. Baking Soda- a personal favorite of mine! Add a tiny bit to your favorite cleanser and you have a homemade facial scrub. See full instructions here. 4. Jojoba Oil- the perfect all natural facial moisturizer. Jojoba oil is super light weight and actually mimics your own skin's natural oil production. It can actually "trick" your skin into thinking it has produced enough oil, which can help balance oil production. A few drops is all your need. You can also add a few drops to your favorite conditioner if your hair is feeling dry and frazzled. 5. Tee Tree Oil- a great spot treatment for acne. It is even better when applied cold. For more info you can read this post. 6. Dr. Jart Pore Medic Pore Clear Mask- a single use mask that tightens pores and controls oil. I have used this and I love it! 7. Rosebud Salve- a must have! This is one of my favorite products. Great for keeping your lips moisturized and also a great treatment for dry cuticles. Do you have any favorite inexpensive products that you use and love? Please share! I've seen this baking soda remedy in various places now -- I must try! I use Vaseline as an eye make-up remover and I love it! It removes everything! I had been wondering about those Neutrogena naturals products - glad to know you like them! This was a great post! Thanks for the tips! I am going to write these down for the next time I go to the store! I love reading all of your skin tips! I'm obsessed with my skin so your Monday posts are my favorite! I'm such a fan of that Rosebud Salve...I've had my jar forever and barely have made a dent! I also love jojoba oil, especially this time of year when my skin dries out. Oh, this is a great list! And I LOVE that they are under $10! Thanks for the great tips! Thanks for the great suggestions! I just started using the "earth science" brand face wash, it seems to be helping with the dreaded "pregnancy acne" and it's also under $10 a bottle! I am defintely going to buy Dr. Jart Pore Medic Pore Clear Mask because I am always struggling with blackheads. Oh GREAT tip about the baking soda! I love the Neutrogena naturals line! You are my fave today. I am ALWAYS looking for skin tips from people smarter than me. awesome. I am going to have to check out the neutrogena naturals products! And I love the rosebud salve I carry a tin of it with me in my purse! I have been wanting to try some of the natural scrubs I have been seeing on pinterest. ojoba oil would be a great ingredient to add. I need to buy baking soda! It's good for so many things! I LOVE this post! Been hearing alot about baking soda for the skin, will have to give it a try! I love these thank you. i love rosebud salve!! And I've been wanting to try the Neutrogena naturals products... glad to hear you like them! I love all the great skincare tips and your blog even reminded me to wash my makeup brushes, which I had been neglecting! This is a great post! I love Rosebud Salve for lips, dry patches of skin, and cuticles! neutrogena naturals! i have not seen this line in stores! i love neutrogena but i haaate the added chemicals and things. i need to find this stuff around here. 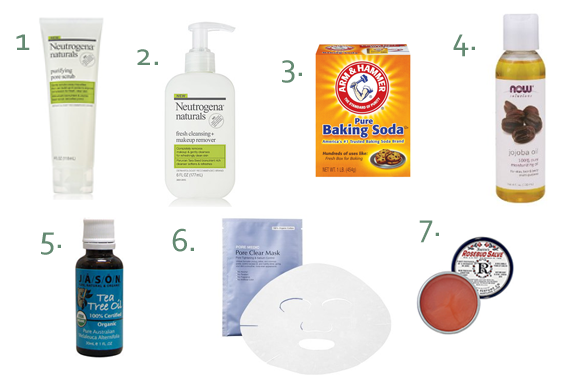 I am so glad to see the Neutrogena products on here, as that's what I've been using lately. What about raw honey for acne? I recently heard about that...what do you think? Can you recommend a good night cream for sensitive skin? Thanks for posting all these tips. I love the baking soda and the apple cider vinegar tips...they both have worked great on my skin! I have found the best of tips from this source. And the regarding products are exclusively looking just affordable. I am totally surprised to see this one. Thanks for sharing. Coconut oil is great for eye makeup remover plus a whole list of other things! I seriously love Rosebud Salve! When I put it on my lips before bed they are so plump in the morning. And a great cuticle saver! I have read in skin care reviews that coconut is very effective in removing cosmetics and maintain a moist clear skin. But for those with an oily skin, you need another beauty regimen. I also love the oil cleansing method...does wonders for my skin also! I just found your blog and can't wait to try some of the DIY skin care recipes! I was checking the ingredient list of the rosebud salve and saw that it contained petrolatum. I was under the impression that it was not a desirable ingredient. Do you disagree? Do you have an alternative idea for a similar salve w/o the petrolatum? Thank you for any advice on this subject! I just purchased the Neutrogena Naturals Cleansing and Makeup Remover and I wondered while I was making the selection if you would approve. Good to know!